Hello! Today we have snow left over from Tuesday, and the temps are in the single digits and haven't been above freezing since it fell, so the snow isn't going anywhere soon. I've been spending some time going through old pictures, and thought I would share some pictures of some of my treasure hunting finds from the past. 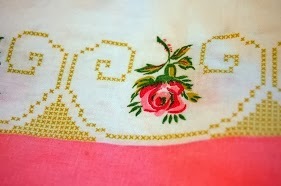 I am also linking up to Colorado Lady's 'Vintage Thingie Thursday' post. One day I was on my way to take my Mama home after a visit, and I decided to take a little detour onto a road that I had never been on before. And no, there aren't many of those in our area ... I love knowing where I live, and make it a point to take new roads when I can. Anyway, back to the story. We went by an old farmhouse with two old (very old) chicken houses alongside it. One of the chicken houses had a sign that said it was a 'yard sale'. It wasn't open that day, but I knew I would go back on day. Fast forward to a few months later, and my friend Phyllis and I were out treasure hunting and the pickins were slim, so rather than go home, I remembered the chicken house and we headed there to see what we could find. The old man who owned it was a sweetheart, and we enjoyed talking to him and shopping around in his large chicken house just FULL of all kinds of things. And I found some great treasures! Do you know what that glass thing is in the picture above??? Well, it is a vintage chicken watering dish. You actually fill a glass jar (Mason, Ball, mayonnaise, LOL!) with water, turn this upside down onto the jar, then turn the whole thing back upside down so the water runs down into the dish. I remember these from my childhood, and had to have this! I think I paid 50 cents for it! ... these two! One of these had never been sewn up to make the pillow case, so it will be easier to make it into an apron ... IF I ever get my sewing machine fixed, but that's another story for another time! 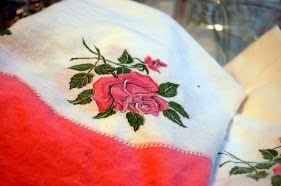 Close up detail of rose pillow case. When new, this bottle held 'Black Draught' cough syrup. The bottle is about 6 inches tall, 2 1/2 inches wide, and less than an inch thick. I love the size, the shape, the color ... just everything about this bottle. In fact, my Mama and I went back a few months ago and I asked if he had any more of them, but they had all sold out! And yes, those pink camellias in the bottle are from one of my camellia bushes ... aren't they beautiful? The added bonus of this trip was that I spent less than $5 for the whole bunch of pretties! 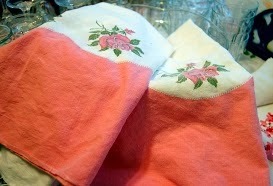 And the last time I went he gave me a vintage Fostoria cream pitcher and cut glass sherbet dish! Mr. Boling sure is a sweetheart! I would love it if you would tell me about some of your favorite treasure hunting finds, so please go and 'LIKE' my Facebook page and leave a pic or just tell me about a vintage find you love!